Reaffirm the love commitment you have taken with your spouse ! Why don’t you take the opportunity of a trip to Europe to have a vow renewal ceremony ? Wether you got married 1, 2, 5, 10 or 20 years ago, it’s never too early or too late to celebrate your wedding vows again. You can also decide to surprise your honey by organizing it with us without your spouse knowing about it. The Eiffel Tower : the best place for a vow renewal ceremony ! This iconic monument of Paris has been home to many romantic movies, as well as vow renewal ceremonies! A symbol of France romanticism, it is an ideal place to reaffirm your wedding commitment. Let’s face it, the Tower area is a popular place. At Love Gracefully, we have identified specific spots that will give you the feeling of an intimate ceremony, in a popular venue. You could choose to surprise your wife / husband with a symbolic vow renewal ceremony in Paris under the Eiffel Tower. We have done it many times, and it was fantastic ! Wether you want it to be a total surprise and we will be waiting for you while you stroll randomly with your spouse, or let her know in the morning so she can get ready and you could get lovely photo shoot. It’s up to you but the result is guaranteed! In 10 years of celebration, Love Gracefully has witnessed over 100 love commitments at the Eiffel Tower, and all of them were a success. You can have a look at the wedding testimonies a newly re-wed couple left on our Youtube Channel. Notre-Dame is without a doubt a hit for Parisian vow renewal ceremonies. If you have already seen it, you probably guess why. If not, here is a sneak peek : picture an old gothic church, set on an island in the middle of the river Seine. The cathedral was the setting of a famous novel telling a popular love story by the Nineteenth century French writer Victor Hugo, called the Hunchback of Notre-Dame. The building in itself is impressive as well as charming : numerous arches, towers, gargoyles and a lovely garden at the rear of it. Quite a romantic setting right ? If you are early-rising people, the garden of the cathedral itself could be a lovely place for the celebration. Another option is the river bank itself, which provides a romantic setting with the river flowing below and its famous bridges under which all French couple hide to kiss. Both locations are gorgeous settings for the renewal of your vows, and the pictures of videos you might want to take back home. 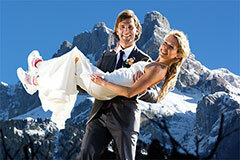 Where to renew your vows ? Renewing your vows is about reaffirming your love in a ceremony made for only the two of you. No more planning, no more guest lists, you are free to plan the intimate celebration you have always dreamed of ! Why not bringing your children, so that they can be the witness of the love they were made out of and have a European family trip altogether? Old Europe is replete with gorgeous romantic locations that could be perfect settings for the reaffirmation of your mutual commitment. Wether you’d prefer to be in a big or small city, by the beach or on a lakeshore, in the mountain or on an island, the options are plenty. 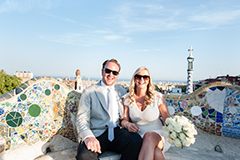 Renew wedding vows in the stunning Paris with the most popular Eiffel Tower and Notre-Dame, and the slightly less popular and very charming Luxembourg Gardens ; the ancient Rome ; the laid back Barcelona ; the sumptuous Venice or the majestic Alps. These are just example of how evocative and seductive European locations can be. Places made for lovers! You will love their beauty and their romance inspiring atmosphere. And if you want to know more about Paris, read why it’s the best city to renew your wedding vows. Because the options are so many, we have selected for you different options of destinations that have been our most asked-for and successful ones. These venues are located in France, Spain, Italy and Switzerland, as those countries offer a whole range of varied love atmosphere and are truly made for celebrating wedding vows. But of course, if you have something else in mind, we will be happy to talk about it with you. For this wedding vow renewal, we want everything to be perfectly suited to your needs and wishes. That’s why we insist on being available anytime to discuss and advise you on the best options of locations and vendors you might want. But of course, you can also come up with your very own idea, and we will work something out for you. 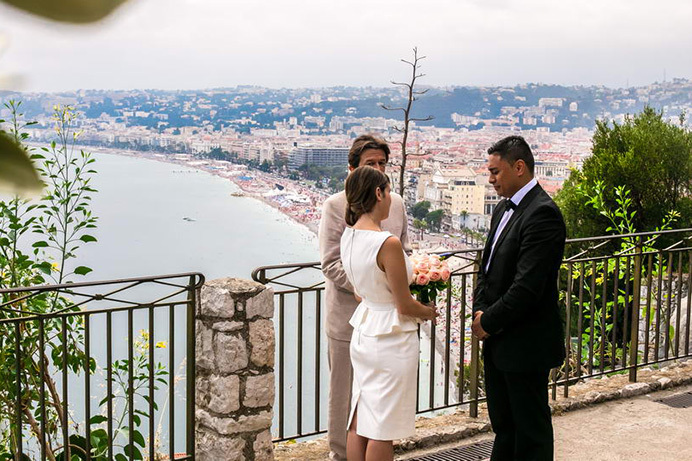 Would you like to see how touching and lovely a vow renewal celebration can go, feel free to watch this video set on the French Riviera. Can you picture yourself there? Well, we can, and you will love what we will create together. Get ready to have the time of your life ! We are committed to offer you an intimate and personalised ceremony. That’s why we love to be in close touch with you from the beginning of the ceremony planning to get to know you and your desires. This means we will work on an original vow text (not a template !) suited just to you. This is where we differ from all our competitors. Our celebrants are all fluent in English (on top of the language of the country you will choose). They are experienced and caring professionals, not students or part-time actors. In order to make things easy for you, we have worked out 5 different packages including the many services options you might want. It’s easy to use and based on a simple idea which is : wherever you choose to celebrate your vows, the price is the same! Would you like a film director by your side during your ceremony and available for a shooting of the two of you in the location of your choice ? Feel free to have a look at a beautiful film a talented wedding videographer, Guillaume Brylac, has crafted for us in Barcelona. Please read our post “4 reasons and ideas to plan a vow renewal“. We are at your disposal would you have any questions, at any time and at no charge !